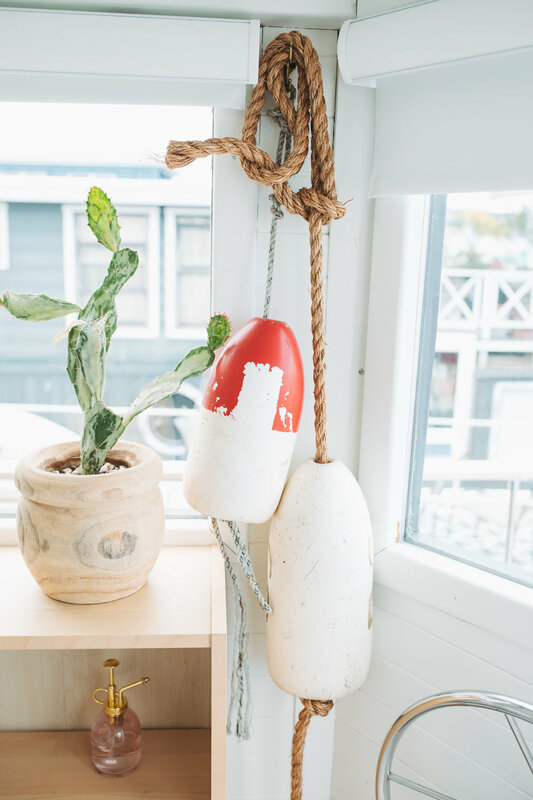 I cannot rave enough about our stay at this beautiful Scandinavian styled houseboat called the "Seattle Lakeside Lovenest"! When I found it on Airbnb, I could not book it fast enough. 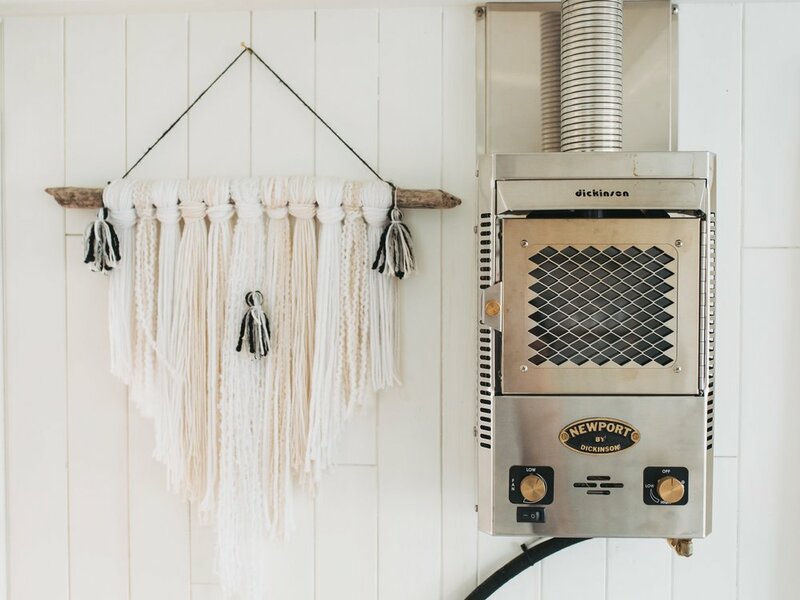 Upon arrival, it was more beautiful than the pictures showed, and the cozy "Hygge" lifestyle vibes made us feel right at home. We had never stayed on a houseboat before, but I was quickly begging Mitch to sell our home and live forever on a houseboat. I mean COME ON just look at this place! 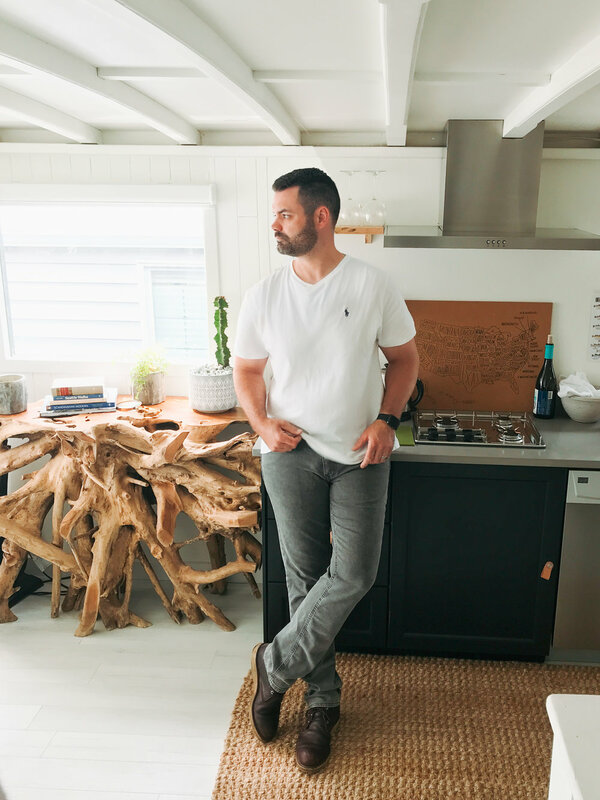 We were lucky to book our stay here before the houseboat was feature on Genevieve Gorder’s new Netflix series “Stay Here”, as I’m sure we will need to book this place farther out in advance now! The detailing of the woodwork on the door was such a pretty touch. Upon entering, the place was so much bigger than I thought it would be base on the photos. The decor has a way of making you feel so relaxed and comfortable (that is, after my heart rate spiked from excitement as I ran around taking photos of everything of course!) The main level bedroom is a king sized bed that is SO nice it makes you feel like you are sleeping on a cloud. I loved falling asleep to the soft sounds of the water, and the very subtle rocking of the boat. To say that I have a current obsession with tree root tables after staying here would be an understatement. It is just. so. beautiful! One of our favorite spots was the beautiful wooden table with plush faux fur bench seats. Our amazing Airbnb host Patsy (who lives in another adorable boathouse nearby) greeted us with a wonderful welcome basket of wine and locally made snacks like the famous Beecher's Handmade Cheese. One morning we got Nutella and banana crepes from a breakfast spot not far from us. Breakfast is = fun on a cute boathouse, with the windows open and the sound of water and passing boats. Side note, I often get asked "Who takes your photos when you two travel?" so I will link HERE the small, lightweight, iPhone tripod and bluetooth remote I use when I travel - it's only $20. So much fun and I haven't even taken you to the second level yet! When you head up the ladder to the second floor, you reach the second bedroom which has a queen size bed and windows all the way around for a great view. I especially loved the plants, nautical touches, and all of the books available to read. Several of which were about Seattle. 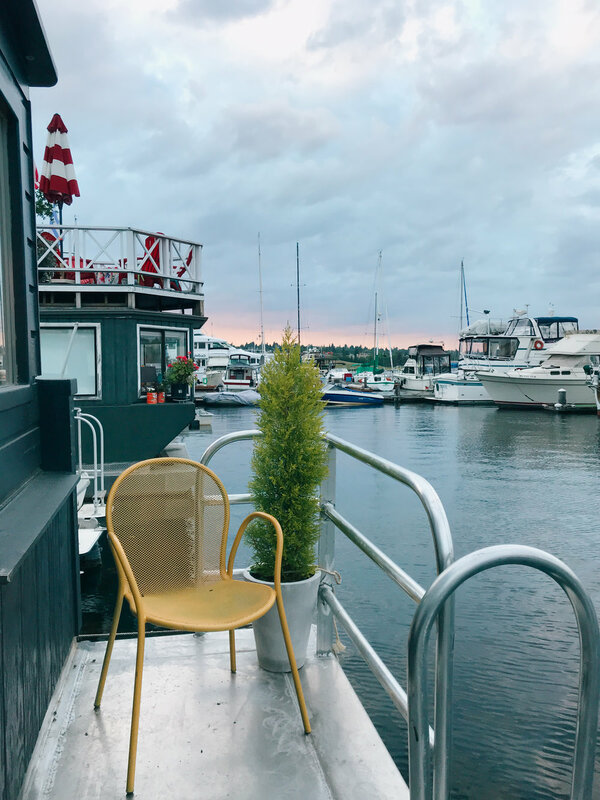 Walk right out the doors of the second floor bedroom and you'll find the cute and comfortable rooftop deck that overlooks Lake Union, Gas Works Park to your left, and the sparkling city lights of downtown Seattle to your right. After a long day of walking all over Seattle, we picked up a pizza and a bottle of champagne and toasted to the incredible trip we had in the PNW on the deck. There is also a little back porch off the main bedroom with two cute yellow chairs as well. It was so relaxing sitting on the water watching the boats, as well as planes taking off and landing on the water. I loved unwinding from our busy sightseeing days on that big rooftop couch. On my list of favorite things, would be cozying up in an oversize sweater, as the sunset darkens and the city lights start to twinkle. Overall I cannot say enough lovely things about our first houseboat experience. ***This AirBnb is currently not available to rent, as Seattle has recently changed their laws about short term rentals. Hopefully this gets changed back!